There are a lot of oils that are beneficial for hair, but it is argan oil that is considered the best by many. This amazing oil is quite expensive, so the best way to use it on your hair is to add a tablespoon or two of oil to DIY hair masks. Here are four hair mask recipes with argan oil that will help make your hair stronger and healthier. 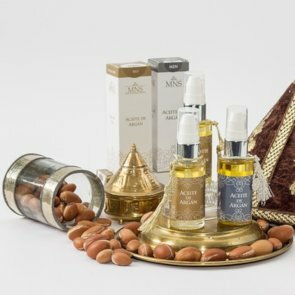 Argan oil is extracted from the oil-rich kernels of the argan tree that is endemic to Morocco. It is primarily composed of unsaturated fatty acids, such as oleic acid, linoleic acid and alpha-linolenic acid. Argan oil also contains saturated fats (palmitic acid and stearic acid), tocopherols (vitamin E), carotenes (provitamin A), squalene and phenols. Moroccan women have long used argan oil to take care of their skin and hair because of the oil’s moisturizing and nourishing properties. This amazing oil helps repair damaged hair, improves its elasticity and flexibility, prevents brittle hair and split ends. In addition, it has a deep conditioning effect; argan oil makes the hair more manageable, prevents it from getting tangled, and makes combing and styling easier. As we’ve already mentioned above, argan oil is quite expensive because argan trees grow only in Morocco, and their number has decreased considerably over the years. So an economical way to take care of your hair using argan oil is to add it to add it to hair masks. Try these hair masks to keep your hair hydrated and achieve a silky hair texture. For this mask, you’ll need 2 parts extra virgin olive or coconut oil, 1 part 100% pure argan oil and 1 part raw, organic honey. If you’re using coconut oil or thick honey, you may need to melt them in a double boiler before mixing them with other ingredients. Whisk all ingredients together, add a few drops of your favourite essential oil or oils (optional) and stir until well blended. Apply the mixture to your hair, section by section, focusing on the scalp and on your ends. Massage the mask into your scalp and put on a shower cap. Let the mask sit for at least 15 minutes, then shampoo and condition as normal. Rosemary essential oil is a traditional hair remedy. It helps eliminate dandruff and relieves itchy and flaky scalp thanks to its antiseptic and anti-inflammatory properties. In addition, this oil boosts circulation, which results in improved hair growth and reduced hair loss. The stimulating effect of rosemary oil combined with the nourishing effect of argan oil will make your hair grow strong and thick. To prepare the mask, simply mix 1 tbsp of argan oil with 4–9 drops of rosemary oil. Apply the mixture to your scalp and massage for 2–5 minutes. Put on a shower cap or wrap your hair in a towel and wait for 15–20 minutes. Then wash your hair as usual. If you’re not a fan of rosemary oil, you can use other essential oils. For example, lavender oil also prevents dandruff and soothes the scalp, thyme oil produces an antioxidant effect and keeps the scalp healthy, and cedarwood oil makes the hair silky and shiny. This is a very simple yet effective mask designed for dry and damaged hair. It repairs rough and dehydrated hair, makes it more manageable, and restores the hair’s natural elasticity, flexibility and glossy shine. Put ½–1 tsp of argan oil, 1 tbsp of lemon juice, 1 tsp of olive oil and an egg yolk in a bowl. Whisk all ingredients together until smooth and well-blended. Apply the mask to your hair from root to tip, paying special attention to dry and split ends. Leave on for 15–20 minutes, wash your hair with your regular shampoo and condition as usual. Eggs are an excellent source of proteins and other nutrients for your hair. Combined with argan oil, they strength hair follicles and strands, make the hair silky soft and tangle-free, prevent brittleness and dehydration. In addition, this mask contains lavender essential oil that prevents dandruff and flaky scalp. Crack one or two eggs (depending on the length and thickness of your hair) into a mixing bowl. Whisk well until the white and the yolk are well-combined. Add 1-2 tsp of argan oil and 10 drops of lavender oil. Whisk again until the mixture is smooth. Apply the mask to your hair section by section, using your fingers or an applicator brush. Put on a shower cap to help the mask penetrate deeper into your hair strands. Wait for at least 10 minutes and wash your hair thoroughly with your regular shampoo. Be sure to use cold or cool water, otherwise eggs will start to cook right in your hair.